The Scars site has now run out of codes. For everything you could want to know about the For Honor beta, we’ve got you covered. Ubisoft have shared some details about exactly what’s in For Honor’s closed multiplayer beta. In addition to signing up for a chance of getting in, you can now also explore an interactive website for a guaranteed code. For Honor is one of our most anticipated upcoming PC games. Nine of For Honor’s 12 starting heroes will be available to play – three from each faction. If you live your life by bushido, you can represent the Samurai as one of the Orochi, Kensei or Nobushi. 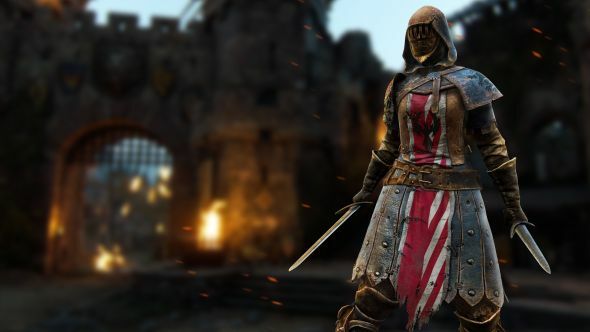 If your martial code is chivalry instead, you can play as the Conqueror, Warden or Peacekeeper knights. And if you have no code, you can be one of the following varieties of Viking: Raider, Berserker or Warlord. Incidentally, the fourth Viking class, the Valkyrie, got a trailer yesterday. Three of the game’s five modes will be available: Dominion (4v4), Brawl (2v2) and Duel (1v1, obviously). For the first time in For Honor’s pre-release testing, you’ll also be able to engage in the Faction War, a global, cross-platform event that illustrates the ongoing war between the three factions. The closed beta will run from January 26 to 29. Sign-ups went live in December and are availablehere, but it seems they don’t guarantee you a place. For that, you can go to Ubisoft’s new interactive website, which continues the precedent for silly names laid down by For Honor’s in-game currency (‘Steel’), in that it’s calledSCARS. SCARS will tell you more about For Honor’s warriors and the lore behind them. If you complete the whole experience, a code to the closed beta is your reward. For Honor is due for release on Valentine’s Day. Remember: nothing says “I love you” like an ultra-violent medieval combat sim.